The Immune Tolerance Network is a coalition that was set up in 1999 to focus on moving potential therapeutic treatments from laboratory research to clinical use. The general aim of these treatments is to suppress overactive immune responses. This is useful in both organ transplantation (where you don't want your immune system to reject the foreign tissue, nor do you want lymphocytes in the foreign tissue to start attacking you) and autoimmune diseases (where you don't want your immune system to attack your own tissue)*. In a recent issue of Immunity, Jeffrey Bluestone, William St. Clair and Laurence Turka, core members of the Immune Tolerance Network, have described the history and current state of development of CTLA-4-Ig, a drug that has shown effectiveness in both treating arthritis and improving organ transplation. 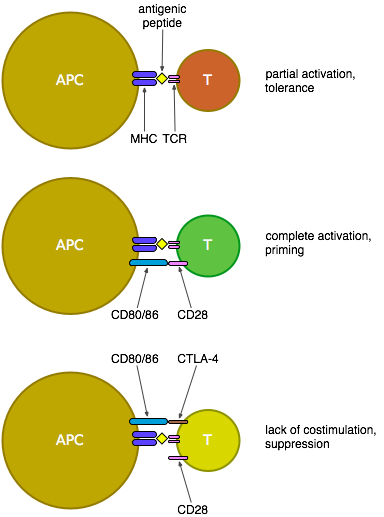 Some background... CTLA-4 is essentially a counterbalance to the previously mentioned CD28: both are expressed on the surface of T cells, but CTLA-4 only becomes expressed after T cell activation - it then competes with CD28 for binding to CD80 and CD86 on the surface of antigen-presenting cells (APCs). CD80/86 bind preferentially to CTLA-4, thus suppressing the activation of the T cell; this built-in limit prevents T cell activation from spiralling out of control. The CTLA-4-Ig attempt to suppress T cell activation uses a manufactured free-floating version of CTLA-4 that binds to CD80/86 and so prevents their signalling to CD28 and the ensuing costimulation of T cells, thus blocking the development of an effective T cell response. CTLA-4-Ig (a.k.a. abatacept, manufactured as Orencia, or belatacept) has been tested in people and apparently tolerated well, as it's a relatively mild treatment that doesn't directly stimulate T cells, though there's still some concern that this treatment—due to its incidental blocking of the suppressive signal from CD80/86 to CTLA-4—may have a negative effect on regulatory T cells and thus eventually promote autoimmunity. There are two points in this article that are particularly relevant at the moment. The first is the shelving of a similar (co-)treatment based on CD40L—another molecule that facilitates communication between T cells and APCs—after human trials of CD40L-Ig caused unpleasant side effects in a few patients, who experienced "thromboembolic events most likely due to reactivity of the monoclonal antibody with CD40L expressed on the surface of activated platelets". The second point is a small mention of an Fc receptor-nonbinding form of CTLA4Ig, which may have been a promising treatment that would reduce the likelihood of APC clearance by the spleen, but is currently placed on hold "due to intellectual property issues". As has been mentioned in numerous articles recently, no-one wants to hear that making a treatment available to patients, working on a particular disease, or even considering researching the interaction between two molecules, could be infringing on someone else's patent. * The opposite of organ rejection and autoimmunity would be vaccination (where you want your immune system to attack foreign pathogens) and tumour immunity (where you want your immune system to attack your own, mutated, cells).